The Nebraska Cornhuskers head to Columbus, Ohio, for the first time since 2012 looking for a different outcome than it walked away with four years ago. The challenge of defeating Ohio State isn't any easier today than it was then but the Huskers have said they're up for the challenge. What exactly does Nebraska need to know about this year's Buckeyes? We reached out to Eric Seger of Eleven Warriors to shed some light on what the Huskers are up against in Columbus. Q: How can Nebraska defeat Ohio State? ES: The concern in Columbus for the last month among those outside the program is the lack of a downfield threat in Ohio State's passing game and rightfully so. J.T. Barrett isn't attempting too many throws past 20 yards and the absence of explosive plays is concerning among fans after the way the Buckeyes averaged 56 points per game in the non-conference, including a three-touchdown stomping at Oklahoma. The best way for the Cornhuskers to pull the upset is to not allow Ohio State's deep throws to connect and make some plays on special teams. In recent weeks, teams are playing deep Cover 3 against the Buckeyes and forcing them to take the underneath throws. Barrett is excellent at protecting the ball, so if Nebraska can cause an interception or fumble and turn it into points to get ahead early it will put the stress on the offense to catch up. Nebraska's defense is excellent at creating turnovers (15 interceptions are the most in the Big Ten) so that is essential if it wants to leave Columbus with a victory. With how much talent the Buckeyes have and the continued belief it will improve with more experience, Nebraska needs to force Barrett and the offense to beat them by making some plays. Also, Tommy Armstrong Jr. cannot turn the ball over. The Buckeyes were among the nation's best teams in the first month of the season at picking off passes and returning them for touchdowns. It hasn't happened recently. If it does Saturday night, the crowd will get even more fired up and make it extremely difficult for Nebraska to stay in the game. Q: How can Ohio State defeat Nebraska? ES: With how much Ohio State's offense is struggling to create explosive plays, not taking negative plays and putting its defense in bad field position with turnovers is crucial. The Buckeyes' offense is without an identity right now so it has to take advantage of matchup problems when they are presented. Get Curtis Samuel in space. Run Mike Weber behind Pat Elflein and Billy Price to slog out tough yards up the middle and take a few chances down the field. But above all, protect the football. Defensively, Ohio State has to get to Tommy Armstrong Jr. and when it does, get him to the ground. He is the reason the offense scores points as Nebraska's wide receivers and running backs aren't all that impressive to me. Finally, the Buckeyes can ill afford brain farts on special teams like two weeks ago at Penn State. De'Mornay Pierson-El is exciting and dangerous at punt returner. Keeping him at bay will help Ohio State win. Q: Ohio State's downfield passing game seems to be relatively lacking this season. What's going on there? ES: Like I mentioned before, defenses are doing a nice job forcing Ohio State to take underneath throws and find other ways to move the chains by playing deep zone and preventing deep throws. That being said, it's not like the wide receivers Barrett is trying to connect with are playing that well to begin with. Noah Brown is more of a possession guy that uses his size to body up defenders and make tough catches on the outside. Curtis Samuel is by far Ohio State's best offensive play-maker and defenses are well aware of where he is on the field at all times. Outside of that, Parris Campbell, Terry McLaurin, James Clark and Dontre Wilson haven't made too many plays this season that make you go, 'Wow.' K.J. Hill has but battled an ankle injury and Campbell sprained his ankle against Northwestern last week too. Additionally, Barrett hasn't always had a ton of time in the pocket to load up and throw deep. Three new starters on the offensive line (two at tackle) have struggled at times over the past month, mostly evident in the loss at Penn State when the Nittany Lions sacked Barrett six times and would have been 10 had the quarterback not been able to scramble. In short, Barrett's wide receivers struggle to create separation, the line is working through some growing pains and defenses are playing well off the line to take away the deep pass. Q: The Nebraska coaches have compared Tommy Armstrong Jr. to J.T. Barrett this week. Do you see a similarity between the two? If so, how can each team utilize their QB to its greatest advantage? ES: I do see a similarity, but only because both players are extremely important to their respective teams. Barrett and Armstrong Jr. can hurt defenses with their legs and are more than serviceable passers though the latter is prone to giving the ball to the other team. Everything Ohio State does on offense goes through Barrett. He is allowed to make checks at the line of scrimmage, is trusted to protect the ball because the offense isn't a well-oiled machine right now and if a game gets tight the pressure is squarely on his shoulders to not screw up and make the necessary plays for the Buckeyes to win. I think Ohio State needs to throw the ball down the field in the first quarter on Saturday night to at least show the threat of stretching the defense vertically. Even if Barrett throws the ball out of bounds, it should give the Cornhuskers one more thing to think about and in turn, help open up rushing lanes in the front seven. Barrett is also a great runner but his carries are down recently. Ohio State should try to keep that trend going because if he gets hurt, things get very difficult. As for Nebraska, I love how they use Armstrong as a runner in the option game. To me, that is the wild card in this game. 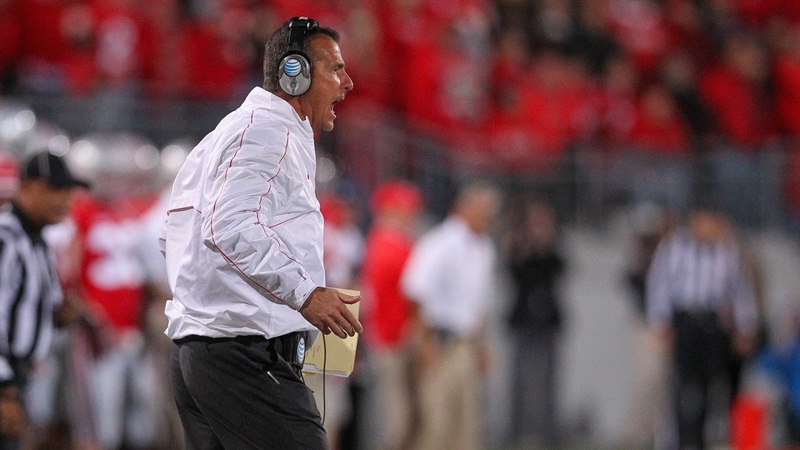 If Armstrong gets loose on the edge and breaks contain, it will be a long night for Ohio State's defense. The Buckeyes struggled to keep Trace McSorley in the pocket at Penn State, watched a bunch of jet sweeps go for big yards at Wisconsin and even let Clayton Thorson—yes, Clayton Thorson—rip off a 35-yard run. Armstrong is fast, strong, agile and a huge threat on the ground. The Cornhuskers need to use that to their advantage but don't force the issue. Also give him some easy throws so he doesn't turn it over and put Nebraska's defense in bad spots. Q: What is the key to stopping Curtis Samuel? ES: That is a tough one. Samuel is a special player and dynamic in the open field. So my key to stopping him is don't let him get in the open field. Easy, right? Media members and fans clamored for Samuel to get more touches in recent weeks and I think Ed Warinner and Urban Meyer did a nice job of doing that against Northwestern. Samuel caught seven passes and ran it seven times against the Wildcats. That is solid balance and they got him space on swing passes and option plays. Those calls didn't always work because the Wildcats did a nice job of playing their keys, getting off blocks and swarming to the football. The biggest thing, however, is when defenders get to Samuel at or behind the line of scrimmage, don't miss tackles. Samuel is a one-cut runner. Thus, when he gets in a one-on-one matchup with a defender in the open field he jukes one way and slashes hard the other. If there isn't another member of the defense close by to help corral him, a big play usually comes. Q: Nebraska has been to Columbus before but for those making the trip for the first time, what are some must sees and dos while in town? ES: Game days get pretty hectic with traffic because so many people are near campus so I always tell people to try and hit up The Thurman Cafe on Thurman Avenue south of downtown before heading toward the stadium. It is not very big so plan to wait a while but the burgers are well worth it. If that's not your thing, tailgating is everywhere off Lane Avenue by the Varsity Club (a 10-minute walk to Ohio Stadium). Other bars: Eddie George's and Zeno's in Grandview, High Beck in the German Village (really cheap domestics) or any other thing you could want along High Street next to campus. Out R Inn right by the Ohio Union is the best. The final thing I always tell folks from out of town to do before going to the game is to attend the Skull Session. Starting two hours before kickoff prior to each home game, The Best Damn Band In The Land holds a pep rally at St. John Arena—right across the street from the stadium—where the team walks through and Meyer says a few words. Even for non-Ohio State fans, it is a must because the Marching Band is unrivaled. Then if you have tickets make sure you're in your seat roughly 25 minutes before kickoff to see Script Ohio. You won't regret it.